The unexpected announcement by Greek PM Papandreou yesterday that he is to call a referendum and ask people to vote about the October 24 agreement is the opening salvo in the endgame of the Greek tragedy. Is this extraordinary gambit a genuine request for a popular mandate or a desperate bluff of a gambler down on his chips? In one obvious way, involving the people in one of the most important decisions of Greek history sounds positive. But as constitutional lawyers and political theorists have explained the use of referenda is not necessarily democratic. Unlike referenda called by a popular initiative, like the recent Italian which reversed the privatisation of water, referenda have been used often to bolster failing governments rather than to give an authentic choice to the people. The formulation of the question by the government according to its priorities, the question’s yes or no character, its lack of nuance and gradation means that on most occasions government referenda are means of blackmailing the people or of forcing an already taken decision. Consider for example the formulation of the question. If it asks people to choose between staying in the eurozone or adopting a new drachma, many people and parties who are against the catastrophic measures agreed by the government may vote for the euro giving a false victory to the government. On the other hand, a question that focuses on the agreement and the new austerity measures it brings will clearly go against the government’s wishes. But such a question is unlikely to be on the ballot box as consecutive polls express the overwhelming opposition of people to the measures. Similarly, some measures the government has often promised but abjectly failed to deliver such as a more energetic tax collection and prosecution of the millionaire tax avoiders are long overdue and absolutely indispensable for turning around the country. However the effects of the totality of measures are overwhelmingly negative. People who would like to approve a positive measure while condemning the majority will be unable to do so. Referenda are blunt instruments. As the small print of the latest Eurozone agreement started emerging it became clear that the headline ‘good news’ was a chimera. Despite the deep austerity already imposed and the new measures planned in the agreement, the Greek debt will still be 120% of GDP in 2020, exactly the same as in 2009 when the Europeans and the IMF arrived in Athens as new colonial administrators. Despite the headline news of a 50% haircut of the debt, once the figures were scrutinised the real reduction of the overall debt was found to be only around 30bn. The Greeks are asked to bleed for at least another 20 years with no obvious improvement in the fiscal position. The debt appears to be only a pretext for the radical change of the social contract. It is used in order to destroy the weak welfare state, to transfer public assets to private hands at bargain basement prices and to turn the Greek workers into a precarious unprotected proletariat. The Greek and European elites desired and used the debt as a social lab for experimenting about the future of a declining Europe. The conclusion is therefore compelling: the referendum is a brutal blackmail meant to give Papandreou’s inner circle of third rate technocrats a stay of execution through the ballot box. The referendum move is the government’s answer to the reaction of the Greek people. No Minister of MP can brave to appear in public without being heckled or ‘yoghurted’. The military parade of October 28 was abandoned as people occupied the street protesting against the measures and most parades in other cities and towns were interrupted. The strikes, occupations and other imaginative protest actions have turned Greece into an ungovernable country. The delegitimation of the government has moved from opinion polls to the streets. The elites who felt for 30 years unassailable, superior almost transcendent to the ordinary people for the first time sense the popular anger and outrage and are unable to comprehend it. The referendum is the despondent ‘acting out’ of a regime that has not an iota of public approval left. This is the context of the bizarre decision to call the referendum, a decision which seems to have taken by surprise even he European protectors of the government. But this is not a late recognition and redress of the repeated humiliations visited upon Greece by the government nor a re-assertion of sovereignty against the IMF and Germany. On the contrary, it is the final gasp, the swansong of a dispirited and utterly defeated group. It is the attempt by Papandreou to pull himself up from his bootstraps ala Baron Munchausen, a desperate effort of a rump of failed megalomaniacs to re-gain the initiative against a whole people who are clamouring to see them exit the stage. And as all such final desperate acts, it is a transparent blackmail and at the same time an extended suicide note. A blackmail of the backbench PASOK MPs who are asked to give a vote of confidence to the government on Friday under the James Callaghan principle that ‘turkeys do not vote for an early Christmas’. A blackmail of the Greek people who are told that unless they accept the catastrophic measures they will be condemned to exit from the euro and living standards of an underdeveloped country. Citizens of an unnamed capital city cast massively blank ballots in two consecutive national elections without any pre-existing party political plan or direction. The right-wing government considers this act high treason and declares a state of emergency. Eventually the government leaves the capital expecting that the resulting disorder will make voters see sense. Life however continues peacefully. The French and Dutch referenda and Saramago offer the two options open to the Greeks. The likely result of the Greek vote whatever subterfuge is used in the formulation of the question will be either non-participation and total rejection of the blackmail or a strong rejection of the government’s position. Whatever the decision, the Italian moment of collapse of the political system has arrived in Greece. It is the responsibility of the radical opposition to start planning the post-memorandum politics of the country. I am conflicted about the issue, but I believe I disagree that the referendum is blackmail. Realistically, the only way for Greece to make a better deal would be if it were willing to risk being forced out of the euro zone. Mr. Samaras may claim that he can get a better deal, but what cards does he have if he is not willing to use a threat to leave the euro zone and default? Similar to the majority of Greek citizens, Prof Douzinas presents an expert analysis of the blackmail aspect of the PM’s decision. I fully agree with his reasoning, I agree with his insights into the failures of the current Greek state, and approve of the clear way he analysed the problem of answering to a referendum with a “yes/no” to a question that has thousands of implications and sub-questions attached to it. However – again similar to the majority of Greeks – he fails to offer a solution, a suggestion, or even a blue-sky idea on how our exit from the crisis should be handled. In summary, I feel that the time has come for our academics and technocrats to focus their efforts in debating solutions (however far-fetched) rather than over-analysing a situation that’s already blatantly clear to everyone. An impassioned assessment of situation in Greece but I agree that the referendum is for the external audience at the expense of the Greek citizens whose wrath it necessarily & unavoidibly provokes for wider propagandist purposes. The question is, will bondholders be persuafed to take an 80% write down to make debt serviceable, vs. default, which one assumes is referendum’s veiled threat? The other question in this debate is the nature & capacity of Greece as a “state” which it is generaally assumed compares with other European states, but which is however debatable given e.g. the dysfunctional tax system & wide misallocation of resources. Being of Greek descent living abroad in a “multiculural” politically defined nation-state it is difficult to grasp the depth of visceral rancour of Greek citizens towards their politicians for beyraying their trust etc. but surely there must be some admission by the Left that this crisis is beyond the remedy of a bunch of officials who were never regarded as anything more than agents of capital. I am baffled by fact that no-one seems to link the fact that George Papandreou is Andreas’ Panadreou son to the current situation in Greece. It was the current prime minister’s father who masterminded the social structure of widespread corruption, getting voter’s (practically everyone) family members (perennially secured) jobs in the public sector in order to gather votes. Public money was carried in big diaper boxes to numbered accounts in Switzerland. Social security funds were drained and money received from the EU for infrastructure was split between a (not so small) elite without producing ANY results. 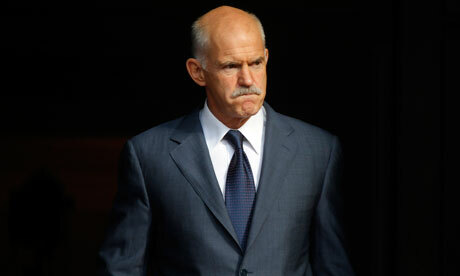 Andreas Papandreou came up with absurd mechanisms used years later by Silvio Berlusconi in order to avoid prosecution and embezzle public funds. The current situation in Greece is a direct result of previous actions of the same political party now in power and of the current prime minister’s own father and friends, some of which still hold positions in the government. Once the rules of the game were set, it did not (and still does not) matter who is in power, who’s son or daughter they are and what their ‘official’ position is (left, right or centre), as it is all spiraling downwards since the mid-80’s. The rules of the game are simple: get as much public money as possible before someone else gets it. And it seems now that there are bigger and more experienced players in the game, still playing the exact same game. The fact that a high percentage of Greeks have benefited short-term from the so called ‘socialist’ approach of ‘everything belongs to everyone who knows someone well connected’ makes it very difficult to change things as it is a cultural issue that has been fermenting for 30 years now. It also makes it very difficult for Greeks to accept responsibility at a personal level, instead of blaming this or that government. Who is kidding whom I wonder?